With the wintery conditions starting to build this time of year, we inevitably start to crave meals that warm us from the inside. After running up and down the cold concrete of the interstate getting whipped around by zooming cars and trucks, nothing warms the fingers and toes like a hot soup. 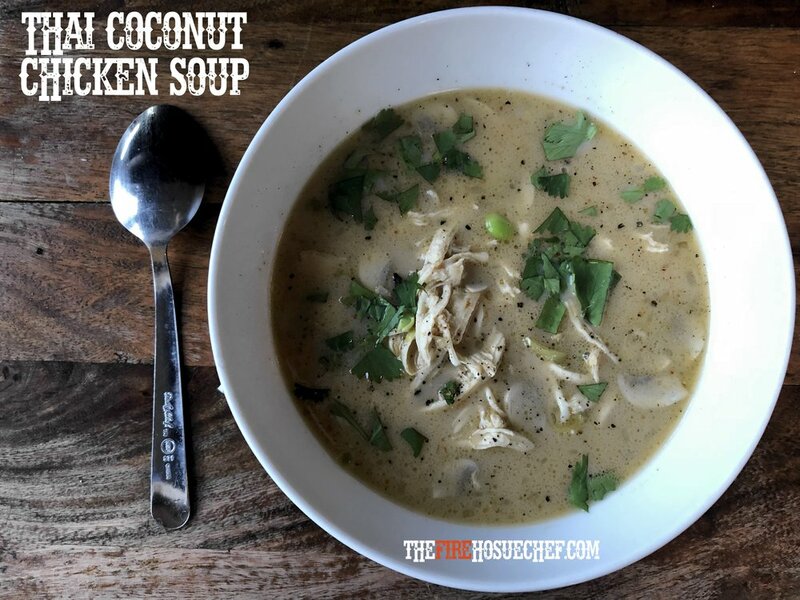 With that, I wanted to share an inspired version of Thai Coconut Chicken Soup that has been a family staple for many years. With that, I wanted to introduce a rich, clean broth with salty, sweet, and sour notes all highlighted by red curry paste. This traditional paste combines many of the flavors that the Thai region has to offer: lemongrass, fresh and dried red peppers, galangal /ginger, shallots, cilantro, lime leaves, coriander seeds, and peppercorn. Without a well stock Asian market near you to collect all of theses ingredients, this curry paste is a great alternative and available at most grocery stores in their International section. A few after the fire critiques: Fish sauce is something I often use for its action packed umami but do yourself a favor and don’t smell it, it will put you on the floor. I list Anaheim peppers as optional for a spicy condiment but jalapeńos or Serrano peppers are subtler options. As toppers go, cilantro is the classic choice but consider additional fresh sliced mushrooms, Thai basil and a wedge of lime. Lastly, in Asian markets cilantro and coriander leaves are the same thing so purchase with confidence. This recipe was inspired from America’s Test Kitchen, they are awesome. Place chicken breast on paper towels, pat dry, and season with pepper and salt. Place on a small plate and let the chicken sit for 15-20 minutes. Meanwhile, heat oil in the saucepan over medium-high heat until it begins to shimmer. Sauté the chicken until lightly browned about 2-3 minutes per side. Remove and transfer to a small plate to reserve. Lower the heat to medium and add the shallot to the saucepan and cook until softened, about 2-3 minutes. Add chicken broth, coconut milk, 2 teaspoons of fish sauce, sugar and mix to combine. Add the chicken and any juices to the pan, bring the broth to a simmer, and cook until the chicken hits 160°F, about 8-12 minutes. Note to flip the chicken breasts halfway through. Remove from heat and let the chicken rest in the broth for 1 hour (that is correct, one hour). Remove the chicken breast and using two forks, shred the chicken into bite size pieces. Reserve. Meanwhile, in a small bowl, add the red curry paste, lime juice and remaining fish sauce and mix to combine. Reserve. Return the broth to a simmer, add mushrooms and snow/snap peas and cook until just tender, about 2-3 minutes. Remove from heat and add red curry sauce and shredded chicken and allow them to heat up in broth for 2-3 minutes. Serve immediately topped with cilantro, optional Anaheim peppers, and fresh cracked pepper. Indulge.